It was time to pull up my garden from the summer. This year I have a roll of barrier cloth to cover it for the winter and prevent the weeds from getting to it (much) (I hope) so that spading it out for next spring won’t be such a job for the elders, whose help I will need. I hope they will be as enthusiastic as this year’s missionaries were, and I promise to feed them from it again. I of course hoped that the first year would be my learning curve, and this year would be gravy. I will pause a moment while we laugh at that thought together. Please laugh kindly. There were some things I learned immediately. I learned the difference last year between “determinate” and “indeterminate” tomatoes in my first purchase. Determinate tomatoes have a set size they grow to, more like a bush, and they tend to mature most of the fruit at around the same time. Indeterminate tomatoes will keep growing upwards, like a vine, and bear over a more extended period. It seemed like a good idea to get some varieties of both types, and that worked out wonderfully the first season. I planned which varieties I would buy again, which one I would pass on, and what I might try new. However, my intent to buy from the parks department greenhouses again came to naught when their website listed the wrong date for the annual vegetable plant sale. The date listed, for which we showed up, had been cancelled and the vegetables sold two weeks earlier in a consolidation with the native shrubs sale; so we were scrounging another source in desperation and took a stab at several unknowns. 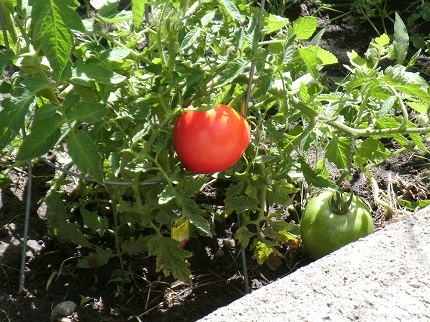 One of those I will look for again; I will pass on the variety that produced a grand total of three tomatoes. The golden-orange cherry tomatoes were delicious and prolific, as last year’s were, and we will buy those again. Celebrity tomatoes were bright red. I planted winter squash for the first time. They’re supposed to be easy to grow. The vines brought out blossoms galore and didn’t set fruit. Why not? A sister in the ward made her first try at pumpkins last year and ended up with more than enough to give out to her daughter’s whole kindergarten class. What did she have that I didn’t have? Lots of bees, apparently; her large back yard bordered on a large park and my tiny one was near downtown. So upon further pursuit of information I now know how to hand-pollinate squash, and that cayenne pepper keeps the squirrels away. The first of my three varieties that did set fruit was almost worn out trying, I suppose, because I didn’t step in sooner; by the time I hand pollinated two blossoms and they started to grow it didn’t put out any more of them. But I did have two squash growing. I was ecstatic — until the squirrels got them in the first heavy rain. My cayenne pepper treatment had washed out. So I put perforated plastic clamshells over the others in addition to the strong smelling stuff. 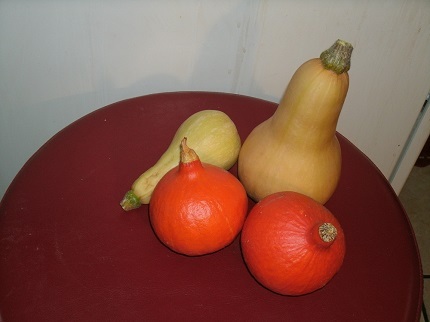 Here is my total winter squash harvest: There weren’t very many and they didn’t grow very big. To tell the truth, they’re pretty puny, but they’re mine. Next year, I will already know that I need to pollinate them by hand and I’ll do it early instead of near their last gasp. I am not ready to give up. I really wanted beets this year; but I didn’t get them thinned out enough because of where I put them. I came up against the reality that for all my determination, I still have a bad back and I can’t spend very long bent over even on a good day. Apportioning the various plants mainly for sun, I had put them in spots that required me to be bent over to tend them. I will have to put them along the outer edge next year where the walkway and retaining wall create ground height. By the time I had a good enough day between weather and my back to pull weeds in the center, there were lots of them, and I inadvertently pulled some of the golden beets out with them, because the leaves don’t have the characteristic purplish bits of normal beets. I have to put the plants that need more tending in the areas that are easier for me to tend. That’s simple. I’ve done well with the tomatoes and green beans and sugar peas, anxious that they have sun, but they grow tall and they can be taken care of at the center. We will adjust the layout next year. But besides placement, the right amount of room is critical. I have to confess that after buying and planting the seeds and watching as they spring up, and looking forward to all these yummy fresh beets I had a hard time, conceptually and emotionally, just plucking them out to discard. I tried separating them and spreading them along, but that’s often less successful. In any event, I didn’t spread them out enough. With my limited plot I wanted as many beets as I could get; the trouble was that they really did need that much space, individually, to grow. They didn’t have it. The green beans and peas need more vertical room next year. I strung twine towards the tall tomato cage to entice the beans sideways when they started to diminish production, and the plants took encouragement and produced again. The peas doubled over on themselves and decided that they were done. We did have fresh vegetables, especially green beans and tomatoes. We did get chard, though it didn’t have enough space between plants to be vigorous. Money was an issue, but I have to get straw mulch or something to keep the weeds down next year, because the reality is that I can’t keep up, physically, with everything I want to grow unless I can make it more manageable. Our Heavenly Father lines out space for us to grow into too. Sometimes we feel really little and that space looks really big, but he knows what’s coming, and what is in us at our roots, capable of shooting forth. And sometimes there are surprises. 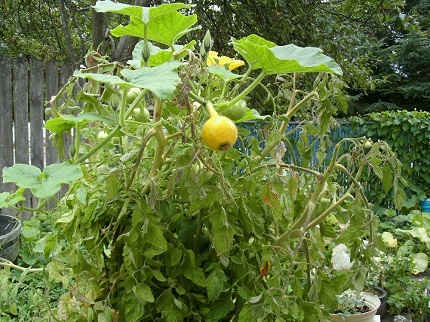 My Japanese heirloom Kuri squash shot a runner sideways through the cage of a very vigorous yellow tomato plant that was over on that side, and when it bloomed, totally not where I expected it, I pollinated it by hand and placed the weight, as it developed, over a wire circle where it wouldn’t break off. In this picture it’s the same yellow as the tomatoes, but it grew and turned orange and was picked, one of the two in the picture above. It found a way to be what it was meant to be, and we can too.